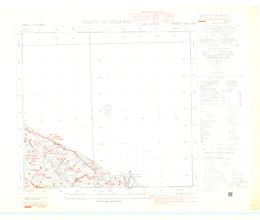 This is a 1:25,000 scale going map of the region of Porto Di Pesaro, Italy. It is the third edition of this map, published in August 1944 by the Geographical Section, General Staff (GSGS) of the War Office of Great Britain. This overprint was created for the purpose of assessing obstacles and terrain for armoured fighting vehicles (AFV).